As has been said herein repeatedly, the Saturn V was a big vehicle and its length helped to contribute to one of the most uncomfortable sensations most crews had to tolerate during their ascent to space - pogo. Pogo was named after a stick-like toy of the 1960s on which children could bounce along, aided by a large spring that stored the energy of each jump. Engineers found that many rockets, not least the Saturn V, were prone to severe longitudinal vibrations which they called pogo for obvious reasons. These could, and sometimes did, cause serious damage to launch vehicles. Like all structures, the Saturn V was prone to resonating at particular frequencies. It operated in a highly dynamic environment; five huge engines were pushing forward and liquids were flowing by the tonne to the rear, making the vehicle especially susceptible to vibrations along its length. Ugly mechanisms took hold whereby small, perfectly normal variations in the engines' thrust affected the pressure of the propellant feeding those engines. This resulted in further thrust variations that interfered with the flow of large volumes of propellant coming down the pipes, inducing ever larger surges, and the natural resonance of the rocket's huge structure sometimes reinforced these vibrations. Moreover, as the tanks emptied, the resulting resonances constantly changed, sweeping through a substantial range of frequencies. To further complicate matters, payloads and mass distributions were altered from mission to mission, which changed the nature of the pogo vibrations and made it difficult to design the problem out of the structure. Contrary to popular misconception, pogo was not related to the tendency of liquid propellant to slosh about in the tanks, although this phenomenon also had to be suppressed by the installation of anti-slosh baffles within the tanks. The second unmanned test flight of the Saturn V (Apollo 6), suffered a spell of pogo in its first stage that would have nearly shaken a crew senseless had there been anyone on board. Engineers suppressed the S-IC pogo problem by pumping helium into cavities in the propellant lines to make them act like shock absorbers. However, pogo was never completely eliminated and affected most of the operational flights to some degree. As Apollo 8 ascended, Frank Borman relayed his impressions. ''Okay. The first stage was very smooth. And this one is smoother.'' Perhaps he was trying to keep the flight controllers from worrying because his crew, and others on the early Apollo flights, noticed that pogo was especially strong towards the end of the second stage and, according to his post-flight debrief, it gave Frank Borman a little cause for concern. ''Quite frankly,'' he said, ''it concerned me for a while, and I was glad to see S-II staging.'' By Apollo 10, engineers had decided that shutting down the S-II's centre engine early would be the easiest way to avoid pogo in that stage, but when Apollo 13 ascended on its second stage, the pogo vibrations got so bad that switches designed to detect improper thrust in its central J-2 engine were inadvertently activated and the engine shut itself down early. Jim Lovell was in command: ''Houston, what's the story on engine 5?'' Capcom Joe Kerwin in mission control didn't know why the centre, or inboard, engine had quit but he was being told that the other engines were doing a good job. ''Jim, Houston. We don't have a story on why the inboard-out was early, but the other engines are Go and you're Go.'' Fred Haise was monitoring the rate at which their height was changing, a quantity known as h-dot, and immediately saw that they weren't gaining as much height as expected. ''Okay. We're a little bit low on h-dot now, but that's to be expected.'' The loss of the centre engine was not as problematic as might be expected, because the other four engines continued to give a balanced thrust and the instrument unit compensated to some extent by burning them for longer, using up the remaining propellant. The crew continued monitoring. ''Didn't like that inboard [shutting down early],'' said Lovell as the S-II drove on using four engines, but his CMP Jack Swigert gave him comforting news. ''Okay, we're 1,400 feet a second low on vI. That's not too bad.'' The quantity vI was their inertial velocity. Swigert realised that although they were 430 metres per second slower than they should have been, the Saturn had enough in reserve to make up the shortfall. "Watch the trajectory closely, Jack,'' asked Lovell. "You're S-IVB-to-orbit capability now,'' announced Swigert eight minutes into the mission. If the S-II gave up completely, the S-IVB third stage would have enough power to take them into Earth orbit. Mission control reassured them that the Saturn wasn't defeated yet. "Roger," replied Lovell before asking Haise, "How's those systems, Fred? Are there any...'' His lunar module pilot was quick to reassure, "They're looking good.'' Swigert continued his analysis. "Okay, now, h-dot is low, Jim, [but the] S-IVB ought to pick you up.'' The S-II was not meant to take Apollo to orbit anyway and the final burst of speed was provided by a short burn by the S-IVB. Lovell was concerned that if the S-IVB had to make up more speed to compensate for his ailing S-II, it might not have enough propellant left over to send Apollo 13 to the Moon. He need not have worried. 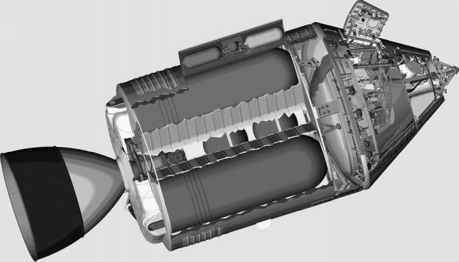 Changes to the pipeline feeding LOX to the centre engine made sure that this particular source of pogo was suppressed in future flights. Once in Earth orbit, Lovell summed up the experience: "There's nothing like an interesting launch,'' he said, not knowing how 'interesting' Apollo 13 was to become.